Saracens have continued their recruitment drive with the announcement that Sale scrum-half Richard Wigglesworth will join them at the end of the season. The news comes following confirmation that England prop Matt Stevens will join the Watford-based club at the end of his two-year ban for drugs offences. 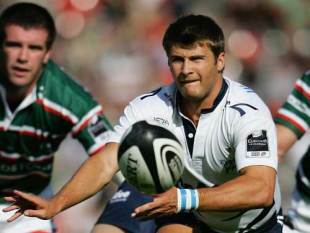 A Guinness Premiership winner with Sale in 2006 and capped five times by England in 2008, Wigglesworth has struggled for starts at Sale due to the presence of Welsh scrum-half Dwayne Peel. Saracens currently boast Justin Marshall, Neil de Kock and Moses Rauluni as their options at No.9. "Richard is a top quality international in the prime of his career, and his eagerness to join Saracens is further evidence this club is going places," Saracens director of rugby Brendan Venter said. The Sharks have also suffered a double injury blow in the wake of their Heineken Cup exit at the hands of Toulouse. Flanker Luke Abraham suffered a broken jaw in the game, while Samoan centre Andy Tuilagi re-broke his arm. There is currently no timeline for their return. "That just about puts the icing on it for us," director of rugby Kingsley Jones said. "To pick up two bad injuries like these, as well as going out of Europe, is not great at all."